The root of perennial herbaceous plant Panax notoginseng (Burk.) F. H. Chen. of family Araliaceae. Yunnan and Guangxi provinces in China. Collected in the end of summer and the beginning of autumn before its blossom, or in winter after seed ripened. Light smell, first bitter and then sweet taste. Heavy and hard, smooth surface with grayish green or yellowish green cross section. Purified, washed and dried in the sun; unprocessed or ground into powder. Sweet, slightly bitter, warm; stomach and liver meridians entered. Resolve blood stasis and stop bleeding, activate blood and alleviate pain. This herb is sweet and slightly bitter in flavor and warm in nature, entering liver meridian and blood system, and good at stopping bleeding and promoting generation of new tissue. It is featured by stopping bleeding without retaining blood stasis and resolving stasis without impairing healthy qi. Therefore, it is indicated for different kinds of interior and exterior bleeding with or without stasis, especially with. It is used singly by oral taking and applying externally. For hematemesis, epistaxis, and metrorrhagia and metrostaxis, its powder is singly used or mixed with rice-water recorded in Bin Hu Ji Jian Fang (Prescription Collection from Binhu). For hemoptysis, hematemesis, epistaxis, hematuria and hematochezia, it is combined with other hemostatics. For instance it is combined with Hua Rui Shi and Xue Yu Tan in Yi Xue Zhong Zhong Can Xi Lu. For traumatic bleeding, its powder is applied externally or combined with herbs that can heal wound and promote tissue regeneration such as Long Gu, Xue Jie, etc. in Qi Bao San from Ben Cao Gang Mu Shi Yi. This herb can promote blood circulation and resolve blood stasis to alleviate pain and eliminate swelling. So it is an excellent herb for various syndromes of blood stasis and a key herb for trauma. It is the first choice for traumatic injuries, fracture and damage of tendon and bone, and swelling and pain due to blood stasis. Its powder is orally taken singly, and with yellow rice-wine or water. For broken skin, its powder is cast externally. When combined with blood and qi-moving herbs the action of promoting blood circulation to alleviate pain is prominent. It is also favorable to carbuncle, abscess and swelling and pain externally. In Ben Cao Gang Mu, its powder, mixed with rice-vinegar, is applied externally to the affected area. 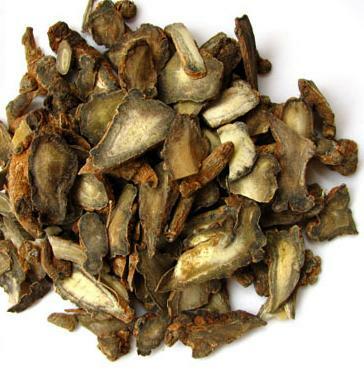 For broken-up carbuncle and abscess, it is usually combined with blood-moving and pain alleviating herbs. For instance, it is combined with Ru Xiang, Mo Yao and so on in Fu Jin Sheng Ji San in Yi Zong Jin Jian. Besides, it also has the action of tonifying and strengthening. For consumptive diseases and impairment caused by overstrain, the common civilians used it stewed with pork. Its powder is orally taken, 1~l.5g. Decoct 3～10g. It is also made into pills or powder. Proper dose for external application. Apply the powder singly or mixed to the affected area.